Emily and Hazel Askew are a young duo making waves on the folk scene with their energetic brand of English folk music. 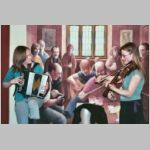 Using fiddle and melodeon, they play and sing with an infectious enjoyment and love for the music, winning them fans wherever they go. From rhythmic foot stomping tunes to powerful interpretations of songs and ballads, their playing always guarantees to engage and inspire those who hear them.